Nazeing Glass can supply commemorative glasses, bowls, awards, paperweights – in fact almost any shape in glass. All our awards are individually designed and made to order. 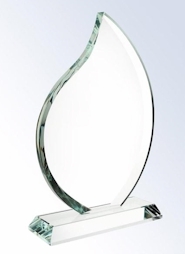 We have hundreds of standard shapes and designs available, from plain glass plaques to complicated 3-d glass shapes, any of which can be customised with your wording and / or logo to create a totally individual award. Although we occasionally create a completely new design or shape to a customers specific brief, the small advantage gained is not usually considered worth the time and cost of a totally bespoke award, especially given the large number of existing designs offered. Standard flat shapes include square, oblong, circle, flame, triangle and arch. Three dimensional awards include cube, pyramid, globe and obelisk designs. An engraved clock, picture frame or pen holder adds functionality as well. To view all the standard awards currently available click here. A guide price is shown for each design which includes the award and a standard box, but an additional charge for setup and engraving will also apply and where applicable artwork charges. Although sandblast engraving is normally used for both text and logos, your specially commissioned glassware can be hand engraved or photo etch engraved if required. To complete the award, a range of packaging options are available, from silk lined hinged presentation boxes to simple cartons. A small selection of standard items ready to engrave are always available to view in our factory shop, but please note, if you do want something really special – do let us have plenty of time!